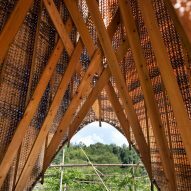 Architecture students from the University of Hong Kong created this woven bamboo shelter for farmers in China's Fujian province by combining age-old weaving techniques with digital design methodologies. Due to its complexity and reliance on skilled labour, the art of bamboo weaving is in steep decline in the region. 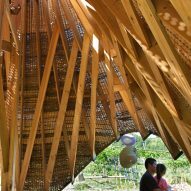 Students from the University of Hong Kong (HKU) worked with local craftspeople and the last remaining bamboo weaver in the village of Peitian to create the Sun Room pavilion, aiming to revive the construction method. The structure is located in a new passion fruit plantation, 2.4 kilometres from the centre of the ancient village. 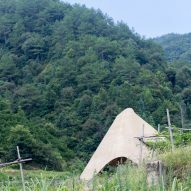 The shelter's concept derived from a desire to regenerate the area's tea houses, which are used as resting spots for farmers working on the surrounding land and to provide shelter from storms in rainy seasons, or from the sun during the hottest part of the day. 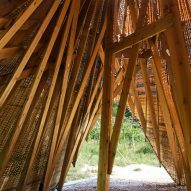 These structures traditionally made from earth and wood act not only as shelters from the elements, but also as meeting places, workshops or stores, explained HKU architecture course leader Donn Holohan. "Historically, these pavilions were often used by craftsmen to demonstrate their skill or to trial new construction methodologies. Today these structures have, for the most part, been replaced by generic outbuildings in concrete and brick," he said. "The craft of bamboo weaving is in drastic decline with only one practicing artisan remaining in Peitian." 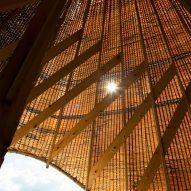 The Sun Room has an outer shell made from woven bamboo, and a pine load-bearing structure that was sourced regionally and cut by local carpenters. The shell's hem has been lifted at various points to provide views out as well as offering the maximum protection from the sun, rain or prevailing winds. 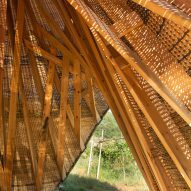 As the shelter faces a network of mountain roads and valleys, these openings also frame each outlook, and produce a unique wave-like effect at the bottom of the pyramidal pavilion. 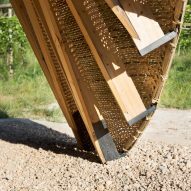 The irregular form made the pavilion difficult to construct using the traditional weaving techniques so the students used digital software to map the length, position and location of each bamboo cane, and CNC machines to cut the material. 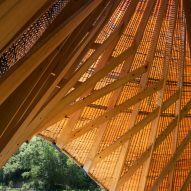 "The overall weaving pattern was developed simultaneously, and adjusted in relationship to the flexibility and dimensional limits of the bamboo," Holohan told Dezeen. "Tools and jigs were developed and then digitally fabricated at HKU using the faculty CNC and robotic equipment. These elements along with the pattern maps allowed the villagers to achieve the complex form without a prior training in the craft of bamboo weaving," he continued. The site is isolated, with no direct road access, so all building elements had to be designed to be easily transported and installed by hand. 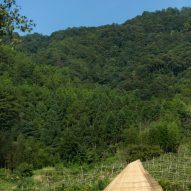 The 20-square-metre shelter was constructed by the students and craftsmen from Peitian, with the village community preparing the site, and the students assembling the retaining walls and basic structural elements and framing with help from local carpenters. 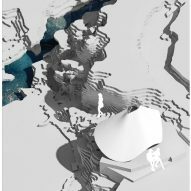 Robotic fabrication and digital technologies are increasingly being explored by architecture students seeking the innovative and efficient ways to carry out projects. 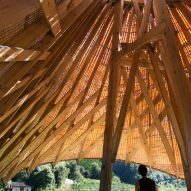 Other examples include a robotically woven carbon-fibre pavilion by researchers and students from the University of Stuttgart, and a robotically fabricated barn by students from London's AA School.